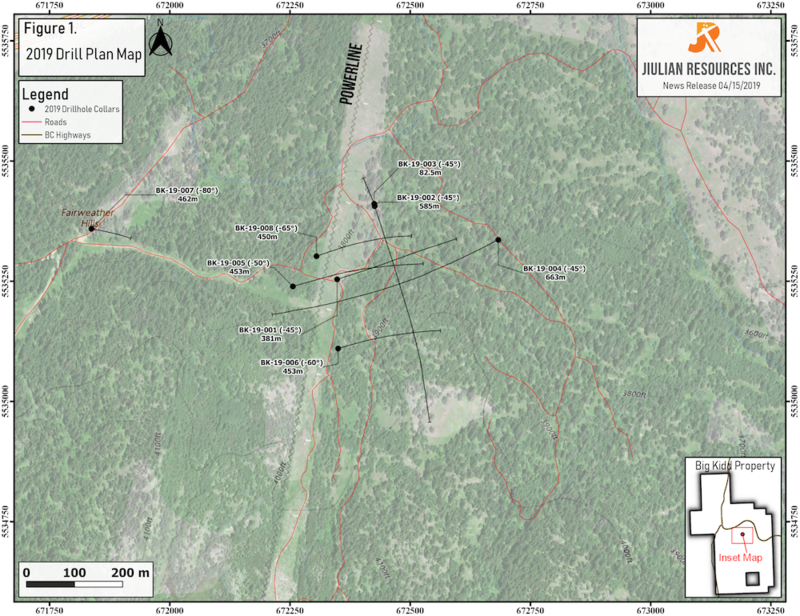 April 15, 2019 / TheNewswire / JIULIAN RESOURCES INC. (TSX-V: JLR) ("Jiulian" or the "Company") is pleased to report initial results for the first two diamond drill holes at its wholly-owned Big Kidd Property ("Big Kidd" or the "Property"), located near Merritt, British Columbia. BK-19-002 returned 0.41g/t AuEq* (0.28g/t Au, 0.09% Cu) over 541m** from 6m downhole. All holes to date have intersected appreciable widths of Au-Cu porphyry style mineralization and alteration. The Company is currently drilling BK-19-009 located 50 meters south of BK-19-004 which is designed to test the Big Kidd Breccia to depths beyond all previous drilling on the Property. Assay results from the remaining holes will be released over the coming weeks as they are received. - Current drill hole BK-19-009 is underway and it is designed to test the system at depth below all previous drilling to date. To date over 3500m of drilling has been completed in 8 drill holes. A table with up to date drill hole data, and significant intercepts are listed below. *Gold equivalent (AuEq) grades are calculated using 200 day moving average metal prices of: gold US$1299.68/oz., and copper US$2.925/lb. Gold equivalent grade is calculated as AuEq (g/t) = Au (g/t) + Cu%*1.407. The factor for copper (1.407) will change depending on the metal price. The metal price numbers listed above were used to determine the conversion factors presented herein. Metal recoveries have not been applied in the gold equivalent calculation. **The intervals reported represent drill intercepts and insufficient data are available at this time to state the true thickness of the mineralized intervals. All gold values are uncut. 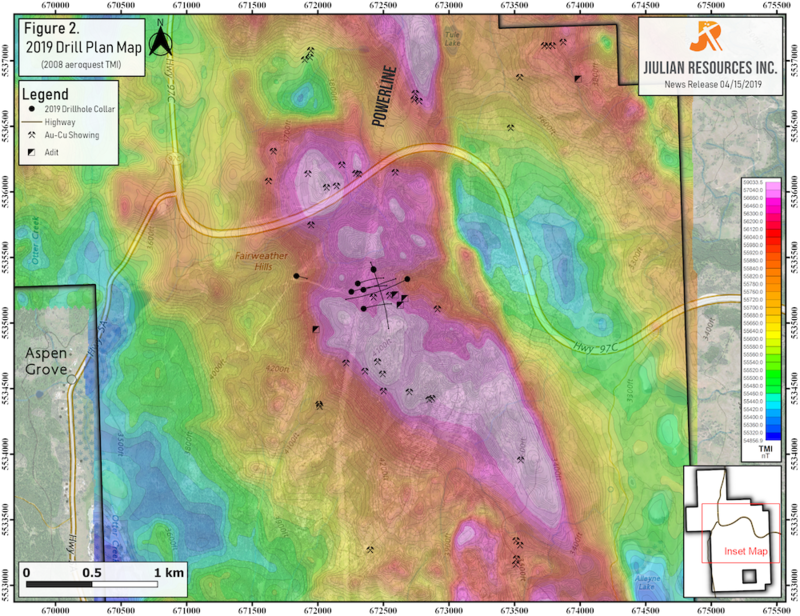 All drill core was logged, photographed, cut and sampled by Jiulian Resources Inc. personnel. Prior to shipment to ALS Global's sample preparation facility in Kamloops, BC, certified reference material standards, blanks, and pulp duplicates were inserted at a ratio of approximately 1 in every 20 drill core samples. Samples were prepared in Kamloops by crushing the entire sample to 70% passing -2mm, riffle splitting off 1kg and pulverizing the split to better than 85% passing 75 microns. After preparation in Kamloops, the prepared pulps were shipped to ALS Global's analytical laboratory in North Vancouver, BC. The gold assays are determined by Au-AA26 fire assay method which reports results in parts per million (ppm) (equivalent to grams per tonne (g/t)). Base metal assays are first determined using the ME-MS61 method (four acid digestion with ICP-MS finish), which reports results as parts per million (ppm). All analyses that reach the overlimits of ME-MS61 are reanalyzed with an Ore Grade method. The analytical results are verified with the application of industry standard Quality Control and Quality Assurance (QA-QC) procedures. Jiulian is an exploration company engaged in acquiring and advancing mineral properties located in southern British Columbia. The Company's flagship asset is the wholly-owned, 4,056-hectare Big Kidd property, located near Aspen Grove, BC. The Big Kidd property is located 25 km (approximately 15 minutes via Highway 97C) east of Merritt, BC, and 102 km west of the Company's head office in Kelowna, BC. The Property has a network of gravel roads, LTE cellular service and a high-voltage power line running across it. Jiulian Resources is listed on the TSX-V under the symbol "JLR".